The other day I watched Andrew putting the finishing touches on the fried turkeys we were planning to take along to a gathering at a friend's house. About 12 pound each, they had soaked in brine for two days then been injected with an emulsion involving cognac, Tabasco and butter. Andrew has fried many turkeys and they are always a big hit but these were different: He had cooked them in a Char-Broil Big Easy oil-less infrared turkey fryer, a contraption he had eyed with suspicion until some total stranger he met at Lowe's raved on and on about his, effectively persuading Andrew to lurk in wait until they went on sale soon after Thanksgiving. The "fryer" (which is to be used outdoors only) is powered by propane, the flame enclosed within the double-walled heating chamber (output, 18,000 BTUs). Upon ignition infrared waves emanate inward from the walls of the chamber, creating a blazing hot cooking environment. The infrared rays push the air out, resulting in meat that does not dry out as it does when roasted. Turkeys (or any other foods) cooked using infrared rays are not technically "fried" as they are when prepared in 5 gallons of scalding peanut oil, but the results closely resemble those fried the old fashioned way. The Turkey Frying Master is now a convert. The turkeys were juicy, crisp, and delicious. The only oil used (other than the butter in the injection marinade), was the tablespoon or so used to rub the exterior of each bird before placing it in the so-called fryer. Other advantages to this thing are that whatever is being cooked (leg of lamb, ribs, chicken, beef, whatever) can be rubbed with spices or slathered with sauces before cooking, it's much safer than the flaming pot of oil needed for traditional frying and there is very little clean-up required. According to Andrew, the infrared fryer has already paid for itself ($70 on sale, regularly $100 to $130) based on savings enjoyed in the cost of oil alone, and cooking with it involves close to zero supervision. He stuck a digital thermometer probe in the turkey, set the alert to go off when the internal temperature reached 165ºF and walked away. One living on a parade route could feasibly toss in a turkey, head out to a parade, and lead a group back for fried bird upon return. Though the manual does not instruct you to do so, when cooking something as large as a turkey the bird must be rotated from time to time or it will cook unevenly. Andrew failed to do this and one of the turkeys we brought for dinner required a trip to the oven. Been using one of these for several years, now have two of them. One for up to 16# turkey, the other up to 25# (don't know if they still make this one) and get rave reviews every time I cook anything in them. Have converted many former oil users to the "Big Easy" oil-less method. Don't know if you are interested, but would love to have your recipe for your injection, sounds really interesting. Love your magazine and your newsletter!!! I want the recipe too!!! I want to know if you can cook a prebrined turkey using this receipe? Yes, you can brine before using oiless frier. I just assembled the Dry-Fryer I bought last year and used it twice at Thanksgiving. Assembly takes 20-40 minutes, depending, and is very simple. Set up a second one and used it with relatives in Denver over Christmas: took half the time of the first one. Also cooked a third 15lb turkey there- usually, cooking time is 10 minutes/pound, but on a cold (16 degrees)windy day we added about 20 minutes to finish the turkey. Haven't had any problems with cooking evenly and don't know why one would, as the turkey is completely surrounded by a stainless steel cylinder radiating heat. 15 lbs seems to be the ideal size: you might be able to stuff a larger bird in there, but probably not much more than 20lbs. All three turkeys we've cooked so far have been /perfect/. I am a big fan. Normal price is $99 to $109 or so, but I see that today (Dec.28th) they are $79 on Amazon. My comment is about the wire basket that comes with the oil-less fryer. I opted to use the stand from my peanut fryer instead. It requires the same triangle hook and give you a better presentation. 1. It eliminates the possiblity of the turkey sticking to the basket and the impressions you get from the turkey leaning lopsided in the basket. 2. 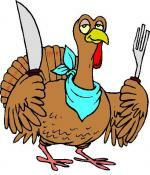 It makes turning the bird over much easier which allows the turkey to cook more throughly. I start breast side down, then I take foil and wrap the legs and flip it to breast side up and continue cooking till I get 162 degres. 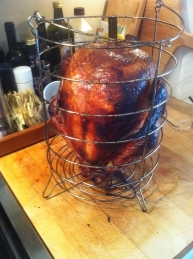 It will continue to cook after you take it out, I tent it with foil leaving the juiciest bird my family's ever tasted! Good luck and Happy Thanksgiving! Just bought an oil-less "fryer" yesterday and will try it out tomorrow. Thanks for the tip about using the stand from your fryer, that's exactly what I'm going to do! Not to mention you don't have to clean the basket, which is a job I would love to not ever have to do again! Thanks for posting about it; damn sure using your method from now on. I had the same problem today when cooking a turkey breast. Thermometer said 165-170 yet it was raw in the center. We ended up cooking it about twice as long as recommended (approx 20 minutes per pound). Made me question whether something is wrong my my new cooker.